What does the VALUES assessment measure? General description: a high result means that the person is loyal to people with whom he/she works, the company, the rules to which he/she agreed and he/she makes decisions on the basis of this value. Recognizes authorities and focuses on the applicable rules. His/her goal is a responsible life style. His/her work style is characterized by visible engagement. Possible limitations: a possibility that he/she will be limited to only one style of thinking. General description: a high level of this value means that everyone will be treated the same, with the same set of rules and benefits at all times. Worried by inequality and internal conflict. His/her goal is to express himself/herself and reach happiness. His/her work style is focused on being accepted by the team. Possible limitations: a possibility that he/she will not keep up with everyday tasks. General description: a person guided by this value likes freedom, wants to do things on his/her own rules and be able to express himself/herself. His/her goal is complacency and he/she focuses on self-fulfillment. His/her work style is distinguished by self-expression. Possible limitations: a possibility that this person will often find himself/herself in extreme situations in which he/she may only win or lose. General description: someone with high justice is willing to compromise and is flexible regarding rules but never forgets about the goal to be accomplished. 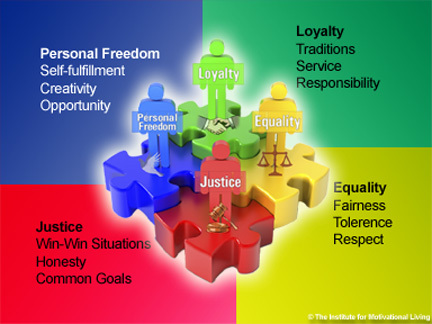 The common good and peace within the group are very important to him/her. He/she avoids situations which are unjust or contrary to his/her sense of justice. His/her work style is characterized by personal engagement. Possible limitations: a possibility that this person will overestimate his/her capabilities and resources. NOTE: There is no such thing as bad values. Once we know the results, we can have a better understanding on the person’s approach to work, communication style, manner of cooperating with others, what he/she finds most important at this time in his/her life, and what he/she may need to become more active and engaged. VALUES is a part of D3 (DISC/TEAMS/VALUES/BAI) assessment, which is possibly the most sensitive competence diagnosis tools in the world, as it combines 4 analysis: DISC (behavior styles), TEAMS (team roles), VALUES and BAI (internal motivations).